(I)t should be an electric atmosphere. Coach Pawlowski and the players have been pounding the pavement to drum up support from Auburn students. Passing out flyers on the concourse, attending Frat Chapter meetings. The whole deal. LSU will travel well and Friday will be one of the best environments Auburn will have seen in a very longtime. This (hopefully) could be the signature win that CJP has been desperately searching for. Tubby. It’s always a treat whenever Dr. Saturday takes on anything Auburn-related at length, and his assessment of Tubby’s takeover at Texas Tech is no exception. Trouble in Knoxville. So Nick Stephens has taken his leave of Tennessee after sliding to third on the Vol depth chart. On the one hand, it’s hard to say Derek Dooley and Co. have lost a lot by saying good-bye to a fifth-year senior who couldn’t beat out Jon Crompton in last year’s QB derby, but still, his options are now 1. a last-gasp first-year JUCO who no one else was seriously interested in 2. a rail-thin true freshman 3. Carnival du Converted Backup Wide Receiver Who Played Option Quarterback in High School. And there are no returning starters on the offensive line. And last year’s top two rushers are gone. I don’t know if it’s going to be the Vols’ worst season ever, especially adjusting for expectations, but it’s not going to be fun. Elsewhere in the SEC, ‘Bama’s finally gotten the league teacher to crack down after telling on everyone for that whole “hey, everyone, schedule your bye week the week before you play them! Watch how mad they get!” thing. Some people just can’t take a joke. (Seriously, though … why has the SEC not been using a computer for this sort of thing?). And Steve Spurrier is apparently going to snap and bench Stephen Garcia at some point this season. (Please against Auburn, please against Auburn … ) And Ole Miss fullback E.J. Epperson has an unusual way with metaphors. Here at TWER we’ve been tracking Ben Tate’s self-promotional adventures on Facebook. It’s turning out pretty well. 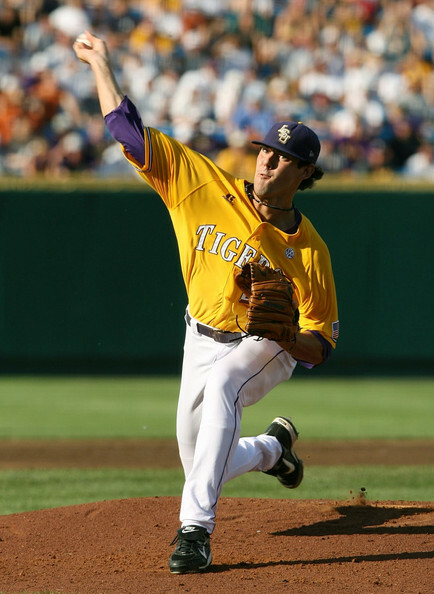 Photo of tonight’s starting LSU pitcher Anthony Ranaudo via. There is no doubt that Dooley has his work cut out for him this year, and likely the next couple of years. I think they’ll give him an honest shot, though, to turn that whole mess around. Whether he’s ready or not for such a task, we’ll see. Gotta say, I’m kinda rooting for Dooley to get it done. Seems like a good guy in a bad situation. Onto USC and Spurrier’s recent comments…I hope that USC back up QB DOES NOT come in the Auburn game…we haven’t had terribly good luck with that sort of thing (see ’08 LSU game). I think we’d have a much better shot with Garcia at qb. He seems like an implosion waiting to happen. Nice work, Jerry, and I’d love to take two out three from the corndogs. War Eagle and have a nice weekend. Big series win against LSU! War Eagle!